I recently bought a faulty Agilent E3631A bench power supply on e-bay which I thought would be a nice addition to my *slightly excessive* electronics hobby workbench. These power supplies are really nice; they are engineered and built like military equipment, good high quality materials and mechanically very robust. An great indication of how good these things are is the second hand values, these things cost $900-$1000 to buy in reasonable condition so they are not cheap. I bought this particular one faulty and thought I would have a go at repairing it. My first impression of the electronics in side was not great, it seemed very seriously over engineered for what it was trying to achieve. It seemed like the designers had a field day adding all sorts of crazy circuits because they could. The ADC is made up of discrete IC’s, there is a custom logic chip in there as well as a CPU, ROM and RAM, there are numerous power supplies for bias and control circuits all floating around each other and most things seemed much more complicated than they need to be. The one real surprise though was the opto isolation in the analogue domain. The CV and CC reference signals from the DAC for the +6v supply are isolated through high linearity opto couplers type HCNR200, this is something that would be crazy to do today when the cost of micro-controllers are so low and have all the goodies like DAC’ ADC’s and PWM’s making isolation in the digital domain a far more sensible design choice. In fairness though, I was making my initial judgements based on what’s possible with today’s components, things were very different 20 years ago so given its age it’s a pretty sophisticated piece of kit really. Once working it does appear to work very well so my initial thoughts are not really founded on anything other than my own instinct to want things to be easier to understand and better as a result. I set out to work on fixing it and found I had to strip it down completely, removing the two boards, front panel, transformer and wiring from the chassis and spread it out on the bench. If you find yourself needing to repair one of these, be prepared to commit serious bench space to the exercise. I have taken a bunch of photo’s if the teardown so you can see what all the bits look like. There were various faults with the PSU, numerous op amps and some CMOS logic IC’s were faulty as well as two open circuit 33k resistors. At a guess I would say there was some kind of big static or high voltage discharge into or across the outputs that caused the original fault. I had to isolate the various areas of the circuit and work on them individually, making assumptions about what should be present in terms of voltage levels and feed in lots of external signals to get to the bottom of each fault. I struggled with the configuration of some of the analogue circuitry – fortunately for me I have a good friend who understands much more about analogue electronics than I do so some exchange of e-mails and sections of circuits with measurements kept me on track and expanded my own knowledge too – cheers Span. While fixing it I also managed to introduce some faults of my own. Specifically I managed to blow two of the HCNR200 opto couplers, easily done just with a slip of a multi meter probe shoring out pins 2 & 3 puts 15v with no current limit straight into the internal LED rendering it open circuit instantly. I managed to blow four of them like this before I figured out what I kept doing – doh! After working through these problems I finally got it working except — when placing a dummy load on the +6 output, the voltage I was measuring went up! A bit more inspiration from my friend Span and a scope on the output and voila – it was bursting into oscillation under load, probably due to the 4 ohm wire wound load resistor. It turned out this was down to the fact that the electrolytic capacitors soldered onto the back of the binding posts on the front panel are actually there for stability reasons – obvious once you know. I had removed the output wiring from the front panel to make it easy to work on. Strapping 1000uF across the output solved the problem. Having worked on this I have been inspired to have a go at designing my own programmable PSU from the ground up to see if I can match the specs but use more modern components and design approach – I will post info on progress if I get around to it. The meaning of Life, the Universe and Value! Wonderful work. Thanks for making it available. hope you get enough time to update it more often. Thanks for your comment. I do enjoy producing the blog content but my time is limited, I will do my best. Really appreciate the schemos, as some grad students took issue with a lab supply we have and rendered it inop. Not sure I really want to work on it, but I do get paid for this. GREAT post. I have been reading alot of the posts about the E3631A and have learned a bunch. I have a Three E3631A power supplies that have failed. They are doing almost the exact same thing with some Small differences. When I turn the Output ON and try to adjust the Voltage on 6V or 25V or -25V the display will NOT change However the voltage OUTPUT does go up and down (on the other it does the same BUT the display has eroneous numbers displayed, AND the Third one will change just a FEW volts on the display). When I enter into the Limiting section the Voltage as well as the Current is adjustable just fine. I have after studying all I can, Verified all supply/bias voltages per the Manual/Schematic (and believe me with 3 different Ground points that wasnt very easy…). I also know it is Not the front display PCB or the Bottom PCB as I had another working unit to do some swapping around with and verified I do have a Top PCB problem???? Any help would be so very much appreciated. Jack, how did you get on with this? I’ve just picked up an E3631A with the same problem; all 3 outputs work fine but the voltage and current read back is wrong when the output is switched on. Looks like it’s end-stopped if you know what I mean, +6V always reads -21.23V,7.629A, +25V reads -34.41V, 1.942A and -25V reads -34.42V, 1.944A. I suspect something around the DAC, hopefully simple. I’ve not yet had a chance to open it up and check the power supply voltages. Did you see TheSignalPathBlog’s repair video on youtube? He repaired an E3634A with a similar fault. You might want to see these other two articles. All of the HP PSU’s have roughly the same circuitry and I have seen the fault you describe, its definitely in and around the ADC, should be easy enough to fix, its most likely to be a failed reference supply. Thanks Gerry I should have mentioned that I’d already viewed your other videos and found them very helpful. I got a chance last night to open the PSU and check a few things. First thing I checked was the ADC REF voltage from U2 (LT1021DCS8-5). It’s a 5V precision reference but although it was getting 12.3V on the input the output was 200mV. Aha, I thought, that was easy. Too easy it turns out. I got an AD584 reference I had lying around used the same 12.3V feed to drive the 5V ADC REF signal. That worked and the 5V held up however the original problem still remains. The ADC REF is used in a lot of places but I guess the next logical place to look is the input op-amps U3A and U3B and trace the signals through the ADC circuit. Yeah sounds like a typical fault finding expedition on these things. Check all the reference voltages on both sides of the opto isolation and make sure you identify your ground points if you want to maintain your sanity. Good luck with the repair. Thanks for the feedback, glad you found it of use. You need to check the reference voltages all around the ADC circuitry, its probably one of them. 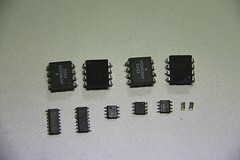 If not that it will be a fault with the ADC circuit its self which is tricky when you repair them for the first time. 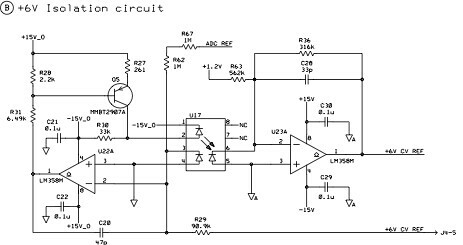 Use the schematic, establish your ground references and then check all of the voltages for correctness. Thanks Gerry, only 2v on the +6v CV Ref line so I guess this is the problem. Track that down and you should have a working PSU, good luck with the repair Ben. Very useful repair info indeed. I am myself trying a cleanup on a similar device. I would like to know how you managed to remove the front panel. I would like to clean the contacts beneath the buttons… but I am afraid to break those plastic tabs. Yes the front panel came apart no problem, the PCB basically slides out, you do not have to move the plastic retaining tabs that much so I think its pretty safe. I’ve bought a Agilent E3631A Power Supply Unit (PSU). Whenever I switch it ON, the house Earth Leakage CB (RCCB) is tripping. When I measured the voltage between Unit Chassis and Supply Earth, it is around 175 V AC. I opened the PSU to look for any active wire touching chassis, but could not find any. Could you please suggest what could be the reasons behind this? I would first have a look at the common mode input filter on the mains side, there is probably two caps from the line down to earth, one might be short circuit. Other than that you may have a short in the mains transformer which will be a much bigger problem. Its hard to say without looking at it but it sounds pretty easy to work out whats wrong. Thank you very much. I’ll have a look into it. As you said, I had a look into the input filter area on the mains side. There were two caps and next to these was a ground wire screwed to the PCB. I’ve moved the ground wire a little away from the caps, and the issue has fixed. Thanks a lot for your help, and apologies for the late reply. We have 3 of these where all 3 have a problem with the control on the front barely works/operates. Any ideas? Not sure what you mean by barely works? Gerry, a great post and info! Thanks for all the hard work you put into this. With this info, I now have the information needed to repair our bad supply. You are welcome, I am glad it was helpful for you. Good luck with the repair. I have the same exact supply (HP 3631A). When I push the power button, the display turns on for about a second, and then turns off and a single ‘beep’ is heard. In The Signal Path’s repair video (found here: https://www.youtube.com/watch?v=vbjSWxWXurE) he troubleshoots the same exact problem, but I don’t believe I’m experiencing the same fault. I’ve managed to get access to a thermal camera and I have observed that F1, U21, and U26 on the top PCB are reaching temperatures of ~100C. Also, U21 on the bottom board is reaching about the same temperatures at start-up. I have yet to begin probing places on the board, as I’m not entirely sure what I should be looking for. I have checked the levels of the bias supplies for the +/-25V power circuit, front panel, and floating logic and all seems okay there. If you have any advice to offer up I would really appreciate it. Hopefully I can bring this unit back to life! Thanks in advance for your help. Its hard to be specific without getting a DMM out and probing around, if you have that much heat dissipating you need to locate the source of the load and isolate it. A good starting point is to check *all* supply and reference voltages. Good luck with the repair. I have a E3631A. Two problems. I was charging a battery with it. I accidentally plugged the battery to the +25V output, with reverse polarity. It smoked a couple traces, which were easy to find. I also melted the +25V supply current sense resistor R66. Soldered back in. Powered it back on, both the current and voltage adjustments work for both +/-25V supplies, but the current is always showing 2.xxxA regardless. The current limit works correctly between 0~ 1A. Checked R63, CR36, CR24 and CR25 are ok.
DOn’t know what to check next. THe other problem was already present when I got this supply as scrape, the +6V supply works, but the current limit adjustment does not work. I have several E3631A power supplies that are having readback issues. You can accurately set the supply for the voltage you want while in the limits mode, but as soon as you push the limits off and it goes into actually telling you what the output voltage is, the display is all zeros. The output is what you set it too, but display reads zero. This is only for the +25 V output, the 6 volt and the -25 volts all works great, you can set the limit and then view the output on the meter. I have gotten pretty good at cleaning the encoder controls and calibrating the output is also easy, however because of the readback issues, the supply will error out and fail the cal, it will perform the 6 volt and -25 volt calibration but will error out with the +25 Volt attempt. I have also went the route of contacting Agilent (Keysight) and asked for assistance but all I got was them telling me to ship the supplies in for a 500 dollar refurbished swap. No more parts and as you indicated, no more schematics (quickly downloaded your copy…thanks) Anyone come across this problem. Howdy folks. Before I ask the question, I thought I would share a quick fix for a common problem with the E3631A power supply and 33220A function generator. The control knob or what I have learned is actually called a rotory encoder (newer version of an RPG?) has a bad habit of acting up and not being able to control the settings. Simply clean the encoders by taking them apart, cleaning the contacts, lifting the spring contacts up a bit, and putting the machine back together. I have probably cleaned and restored function to at least 30 machines. With the power supply, you don’t even need to remove the covers. You can remove the front panel and display board with just 4 screws and the knob nut, you then remove the 4 tabs holding the top part of the encoder, clean it and put it all back together, I have yet to have a unit not benefit from that effort. But has anyone figured out what is causing the readback issues with the power supplies. They are failing and the symptoms are basically the same every time. The unit will produce full voltage and current outputs but only in the program mode. Once the program mode times out or you manually exit the mode, the output voltage is still there but the display either reads zero or some random number unrelated to the actual output. Thanks for any input you guys can provide. Peace and thanks for the manual with schematics download.